Learn the difference: Sun Tanning VS. SunLESS Tanning. You've heard that Spray Tanning & Sunless Tanning is better for you than UV Tanning, but why is that? What is the difference? Take a read below and educate yourself on the difference between Sun Tanning and SunLESS Tanning. What is a UV Tan? Suntans, sunburns, and premature skin aging can all be caused by overexposure to cancer-causing ultraviolet A and ultraviolet B (UVA and UVB) rays. Both types of rays damage the skin cells’ DNA, prompting melanocytes (skin cells in the top layer of skin, the epidermis) to produce more melanin, the pigment that gives our eyes and skin their color. Figure 1. Click on the image to read more from SkinCancer.Org's "Fake it, Don't Bake it" article. UVB causes inflammation, which releases new melanin to neighboring epidermal cells, and in about 72 hours, this leads to further tanning that lasts much longer than the UVA-triggered tanning. All of this melanin production signals that DNA damage has already occurred: it is a far from perfect attempt by the body to protect the skin from further damage. Nonetheless, the damage from repeated UV exposures keeps accumulating and can ultimately lead to skin cancer. 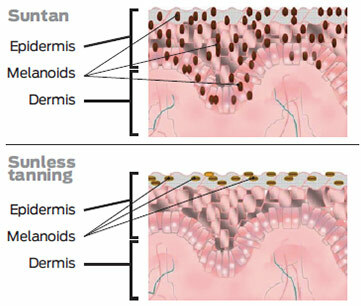 Image from SkinCancer.Org - click the image to read more information on UVA & UVB rays. UVA is the dominant tanning ray, and we now know that tanning, whether outdoors or in a salon, causes cumulative damage over time. A tan results from injury to the skin's DNA; the skin darkens in an imperfect attempt to prevent further DNA damage. These imperfections, or mutations, can lead to skin cancer. Tanning booths primarily emit UVA. The high-pressure sunlamps used in tanning salons emit doses of UVA as much as 12 times that of the sun. Not surprisingly, people who use tanning salons are 2.5 times more likely to develop squamous cell carcinoma, and 1.5 times more likely to develop basal cell carcinoma. According to recent research, first exposure to tanning beds in youth increases melanoma risk by 75 percent. 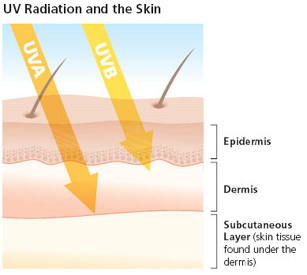 UVB, the chief cause of skin reddening and sunburn, tends to damage the skin's more superficial epidermal layers. It plays a key role in the development of skin cancer and a contributory role in tanning and photoaging. Its intensity varies by season, location, and time of day. The most significant amount of UVB hits the U.S. between 10 AM and 4 PM from April to October. However, UVB rays can burn and damage your skin year-round, especially at high altitudes and on reflective surfaces such as snow or ice, which bounce back up to 80 percent of the rays so that they hit the skin twice. UVB rays do not significantly penetrate glass. What is a SunLESS tan? With sunless tanning, no such damage occurs. The “tan” from most sunless tanners comes from the coloring agent dihydroxyacetone (DHA), a simple carbohydrate. DHA binds to the proteins on the skin’s surface, forming brownish melanin-like molecules called “melanoids” that make the skin appear tan. Unlike UV, DHA does not penetrate beyond the skin surface. As can be seen in Figure 1, it is active only in the stratum corneum, the epidermis’s protective outermost layer of dead skin cells. After learning the above information, you are wanting to re-evaluate your tanning habits and "Ditch the Beds"